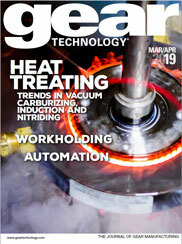 Stay on top of the latest gear industry technology with Gear Technology's Product Alerts. Each month, we bring you 6-12 of the latest new products for the gear industry. January 9, 2019— MORE TORQUE. LESS SPACE. July 5, 2018—How are you testing for grinding burn? June 20, 2018—Remanufactured Fellows 50-8 in Stock Now! May 16, 2018—The Bourn & Koch 400H. American-Built Precision. May 2, 2018—Free admission for PTE readers with code IAMDPTE! December 20, 2017—What is Barkhausen Noise? November 1, 2017—What is Barkhausen Noise? August 2, 2017—What is Barkhausen Noise? July 5, 2017—Integral Gear/Shaft combo by Nordex, Inc.
May 10, 2017—We're Great for Gears in Higher Volumes Too! March 1, 2017—Lighter Gears by Nordex, Inc. Subscribe to the Product Alerts or Subscribe to Gear Technology magazine. For information on advertising in the e-mail newsletter or in Gear Technology, visit our Advertising Information page.